Great first time buyer home situated within easy reach of the city centre and local shops and amenities. The accommodation comprises: entrance hall, 14ft living room, 16ft kitchen/breakfast room, two double bedrooms and bathroom. Externally there is off road parking to the front and a garage to the back of the property. The garden is easy maintenance and is laid to patio. An internal inspection of the property is highly recommended. 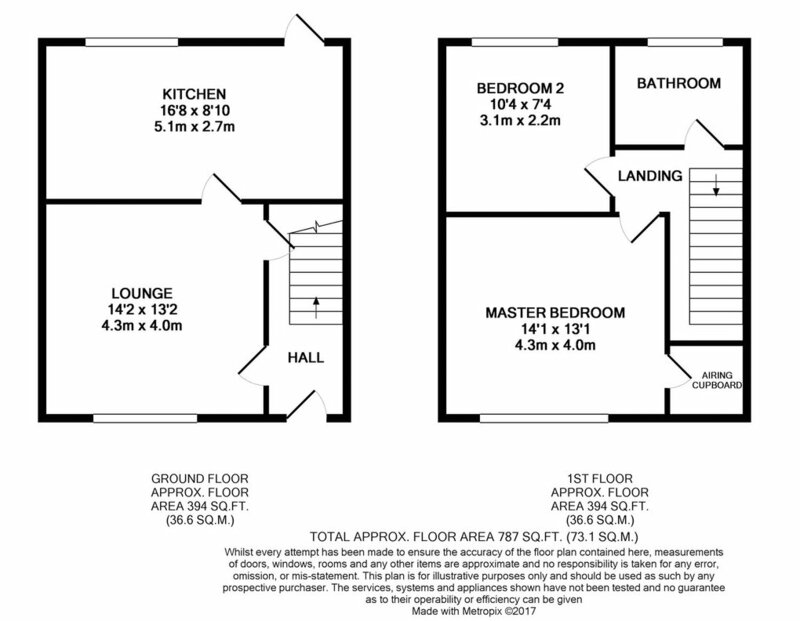 Lounge : 4.3m x 4.0m (14'2" x 13'2"), Double glazed Window to front, radiator, storage space which houses the consumer box and meters. Kitchen/Diner : 5.1m x 2.7m (16'8" x 8'10"), Range of wall and base unit cupboards and drawers, space for fridge freezer/washing machine, electric oven, gas hob, extractor fan, stainless steel sink unit, radiator, dining area, storage cupboard,double glazed window and double glazed door to the rear. Airing Cupboard : , Providing useful storage space and housing meters. Bedroom One : 4.3m x 4.0m (14'1" x 13'1"), Double glazed window to the front, door to the walk in wardrobe which houses the boiler and radiator. Bedroom Two : 3.2m x 2.2m (10'4" x 7'4"), Double glazed window to the rear, radiator. Bathroom : , Obscure double glazed window to the rear, bath with shower above with a glass screen, radiator, low level WC and a wash hand basin. Garage : , Internal door to the garage with up and over door.